Before you read further, please understand that most bitcoin users don’t mine! But if you do then this Bitcoin miner is probably the best deal. Bitcoin mining for profit is very competitive and volatility in the Bitcoin price makes it difficult to realize monetary gains without also speculating on the price. Mining makes sense if you plan to do it for fun, to learn or to support the security of Bitcoin and do not care if you make a profit. If you have access to large amounts of cheap electricity and the ability to manage a large installation and business, you can mine for a profit. If you want to get bitcoins based on a fixed amount of mining power, but you don’t want to run the actual hardware yourself, you can purchase a mining contract. Bitcoin mining is a lot like a giant lottery where you compete with your mining hardware with everyone on the network to earn bitcoins. Faster Bitcoin mining hardware is able to attempt more tries per second to win this lottery while the Bitcoin network itself adjusts roughly every two weeks to keep the rate of finding a winning block hash to every ten minutes. In the big picture, Bitcoin mining secures transactions that are recorded in Bitcon’s public ledger, the block chain. By conducting a random lottery where electricity and specialized equipment are the price of admission, the cost to disrupt the Bitcoin network scales with the amount of hashing power that is being spent by all mining participants. 00db27957bd0ba06a5af9e6c81226d74312a7028cf9a08fa125e49f15cae4979Because the target is such an unwieldy number with tons of digits, people generally use a simpler number to express the current target. This number is called the mining difficulty. 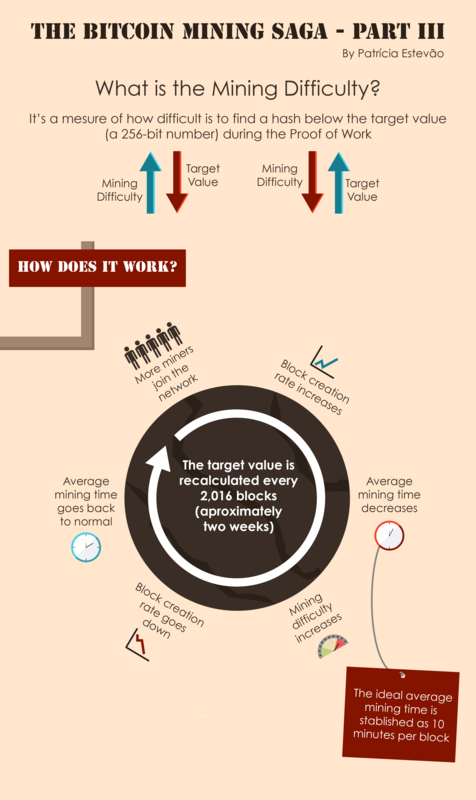 The mining difficulty expresses how much harder the current block is to generate compared to the first block. So a difficulty of 70000 means to generate the current block you have to do 70000 times more work than Satoshi Nakamoto had to do generating the first block. To be fair, back then mining hardware and algorithms were a lot slower and less optimized. To keep blocks coming roughly every 10 minutes, the difficulty is adjusted using a shared formula every 2016 blocks. The network tries to change it such that 2016 blocks at the current global network processing power take about 14 days. That’s why, when the network power rises, the difficulty rises as well. It is conceivable that an ASIC device purchased today would still be mining in two years if the device is power efficient enough and the cost of electricity does not exceed it’s output. Mining profitability is also dictated by the exchange rate, but under all circumstances the more power efficient the mining device, the more profitable it is. If you want to try your luck at bitcoin mining then this Bitcoin miner is probably the best deal. How much bandwidth does Bitcoin mining take? If you are mining with a pool then the amount should be negligible with about 10MB/day. However, what you do need is exceptional connectivity so that you get any updates on the work as fast as possible. This gives the pool members a more frequent, steady payout (this is called reducing your variance), but your payout(s) can be decreased by whatever fee the pool might charge. Solo mining will give you large, infrequent payouts and pooled mining will give you small, frequent payouts, but both add up to the same amount if you’re using a zero fee pool in the long-term. 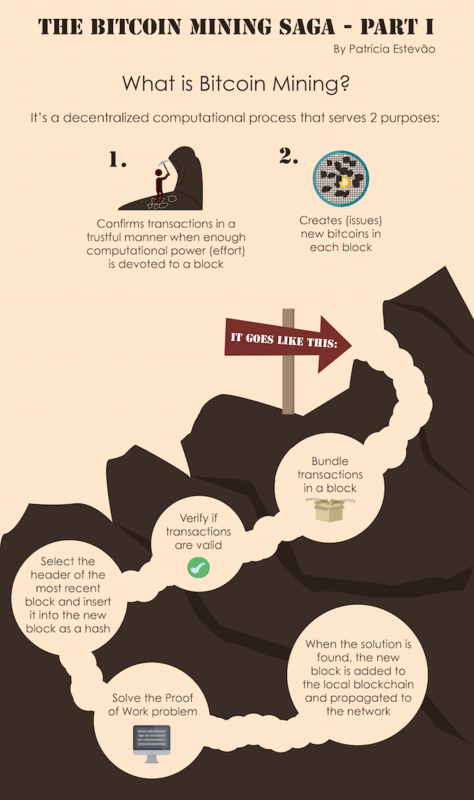 Visualize and Download High-Resolution InfographicBitcoin mining is the process of adding transaction records to Bitcoin’s public ledger of past transactions. This ledger of past transactions is called the block chain as it is a chain of blocks. The block chain serves to confirm transactions to the rest of the network as having taken place. Visualize and Download High-Resolution InfographicA proof of work is a piece of data which was difficult (costly, time-consuming) to produce so as to satisfy certain requirements. It must be trivial to check whether data satisfies said requirements.